Caladium, a tropical perennial, does not usually flower but displays brightly colored red and green foliage. While the plant can be grown from seed, the parent plant's characteristics may not show up. Instead, propagate the plant through division of the tuber. With only a few simple tools and an established Caladium, you add color throughout your garden with many of these colorful plants. Dig up your Caladium tuber in early spring, as soon as the soil is workable. Dust off excess soil from the tuber until you can identify the buds, or eyes, on the surface. Cut the tuber into sections, each containing a pair of eyes. Dust each section with a fungicide according to package directions to prevent fungal problems after the tuber has been replanted. Choose a partially shaded area of your garden to plant your divided tubers. Dig a hole for each tuber one to two inches deep and four to six inches apart. Place a tuber section in each hole and cover with soil. Do not worry about the direction of planting, as the bulbs will align themselves naturally as they grow. Water the bed thoroughly after planting and again every day or two. Keep the soil moist but not soggy. Apply a 6-6-6 fertilizer according to the package directions every six weeks during the growing season. Plant tubers in heavy shade for predominantly green leaves. Caladium can survive winters only in zones 9 to 12. Elsewhere, dig up your tubers as the leaves start to fade and store them in a cool, dry location. 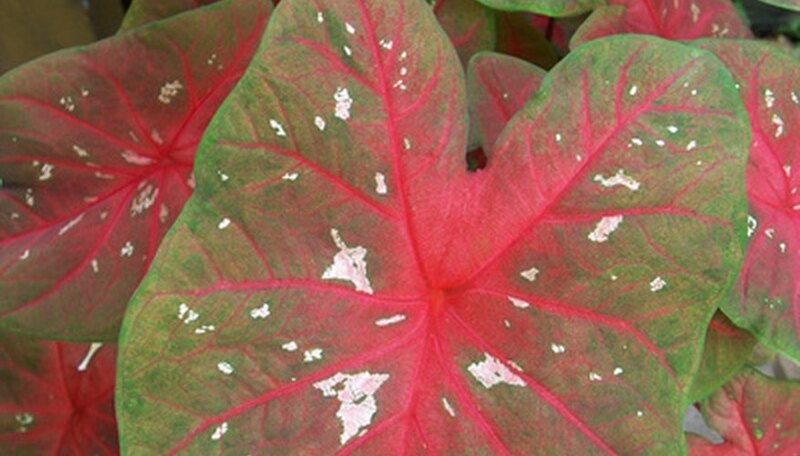 Caladium is known to cause skin irritation on sensitive skin.